"En Otra Voz" is the first Spanish-language anthology to bring together literature from the entire span of Hispanic writing in the United States, from the age of exploration to the present. 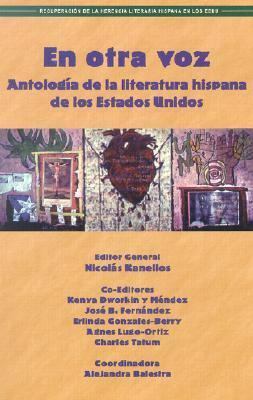 The product of hundreds of scholars, the anthology compiles scores of previously unknown works in the Spanish lanauge written by Hispanics of diverse ethnic backgrounds and classes.Kanellos, Nicolás is the author of 'En Otra Voz Antologia De Literatura Hispana De Los Estados Unidos', published 2002 under ISBN 9781558853461 and ISBN 1558853464. Loading marketplace prices 27 copies from $10.21 How does the rental process work?